The last time I celebrated a fourth birthday, I was about 3 feet tall. My party took place at the brilliantly named Roly Poly Club, a room made up of what I remember as wall-to-wall bouncy castles where my friends and I careered around, fuelled by the heady mix of excitement and mint choc-chip ice cream (there are rosy-cheeked, chocolate-covered photographs to prove this). My mum reminded me recently that I wrote her a shopping list beforehand ‘in case you get it wrong’, consisting simply of ‘mus bus’ (Mars Bars) and ‘sossighes’ (sausages). All the essentials then. Twenty six years later I’ve reached a slightly different sort of fourth birthday, but my priorities are pretty similar. A birthday celebration is nothing without good food. As I’m not throwing an actual party (I’m saving that for the book launch in June, more details to come soon), the food in question is a modest batch of chocolate coconut cupcakes. Modest in quantity that is, because there’s nothing else unassuming about these deeply chocolaty cakes topped with Swiss meringue buttercream and toasted coconut. The other part of this particular birthday which I don’t want to labour, but can’t emphasise enough, is a thank you. To you, lovely reader, for liking and commenting and making my recipes, for letting me know your substitutions and emailing me pictures, for sharing a space where obsessing over cookbooks and ingredients and oddly-shaped cake tins is both enjoyable and normal and for making blogging every bit as fun – in fact so much more so – than when I began four years ago. If I could bake a cupcake to share with each and every one of you, I honestly would. And while that’s sadly logistically impossible, I like to think that offering you this recipe is a good second best. These cupcakes started life with a less than glamorous half tin of coconut milk in my fridge to use up after making porridge. I decided to use it to replace the buttermilk I’d normally add to chocolate cupcakes, adding acidity with a little bit of lemon juice and subbing vegetable oil with coconut for my fat. Coconut oil adds a fragrant sweetness to baked goods without being overpoweringly coconutty, but if you were hoping for a serious coconut hit, fear not: this is where coconut milk Swiss meringue buttercream and toasted coconut flakes come in. I’m not normally one for buttercream, especially the sort that’s coloured or sparkly or compensating for a sad little sawdusty cake underneath. But Swiss meringue buttercream? Honestly? I could eat it by the (serving) spoonful. 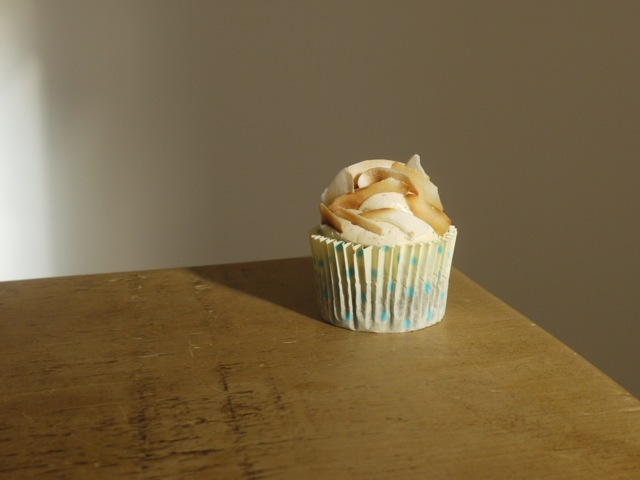 There’s something so more-ish about that silky smooth texture, a little less sugar than your average frosting and although I know it still contains a lot of butter, Swiss meringue is somehow less in-your-face buttery. 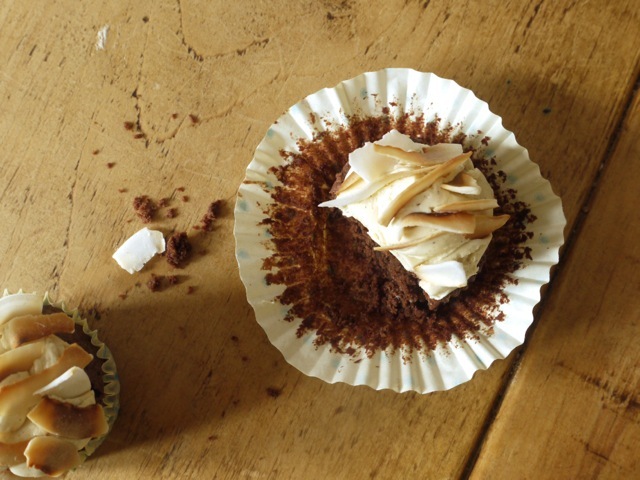 You could top these cupcakes with Greek yoghurt or booze-infused mascarpone (as suggested by Sini on Facebook) but today it’s my blog birthday so we’re going all out. There may not be the balloons and birthday presents and bouncy castle I got the last time I turned four, but there will be chocolate cake and buttercream. 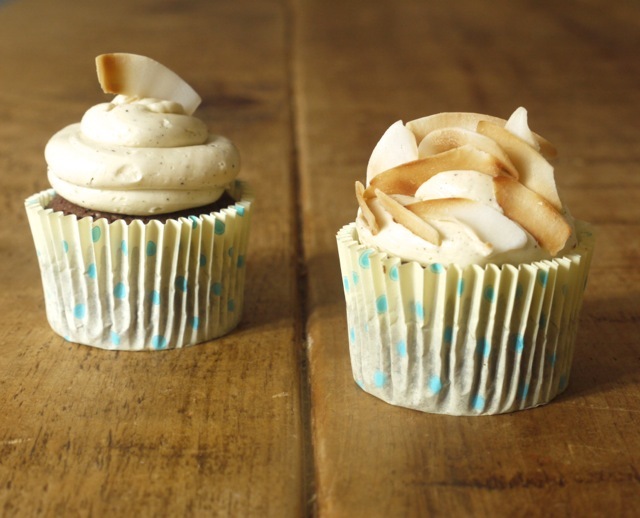 Truly chocolaty cupcakes with a sweet, tender crumb topped with a pillow of coconut Swiss meringue buttercream and toasted coconut. Preheat the oven to 160 degrees C fan. Line two a 12-hole cupcake tin with paper cases. In a small bowl, whisk together the coconut milk and lemon juice. In a heatproof bowl suspended over a pan of barely simmering water, melt the coconut oil and chocolate together, stirring until smooth. Set aside to cool slightly. In a large bowl, sift together the flour, cocoa powder, baking powder and bicarbonate of soda. Add both sugars and salt and whisk to combine. Whisk the melted chocolate mixture into your dry ingredients, followed by the coconut milk. Whisk in the eggs until you have a smooth, thick batter. Divide between your cupcake cases - they should be about ¾ full - then bake for 18 - 20 minutes or until a skewer inserted in the middle comes out clean. Allow to cool in the tray for a few minutes then transfer to a wire rack to cool completely while you make the buttercream. To make the buttercream, combine the egg whites and sugar in a heatproof bowl suspended over a pan of barely simmering water. Whisk continuously using a hand whisk until the sugar has dissolved, about 8 minutes. Test by rubbing a small amount between your thumb and forefinger: it should feel smooth with no grains of sugar. Remove the bowl from the heat and use an electric whisk to whisk until thick and meringue-like and the mixture is no longer warm, about 10 minutes. Gradually begin to add the softened butter, one small piece at a time, whisking well after each addition. The mixture may look like it has curdled, but keep whisking and it will come back together. Once the butter is fully incorporated, whisk in the coconut milk, a little at a time, followed by the coconut extract and vanilla seeds. 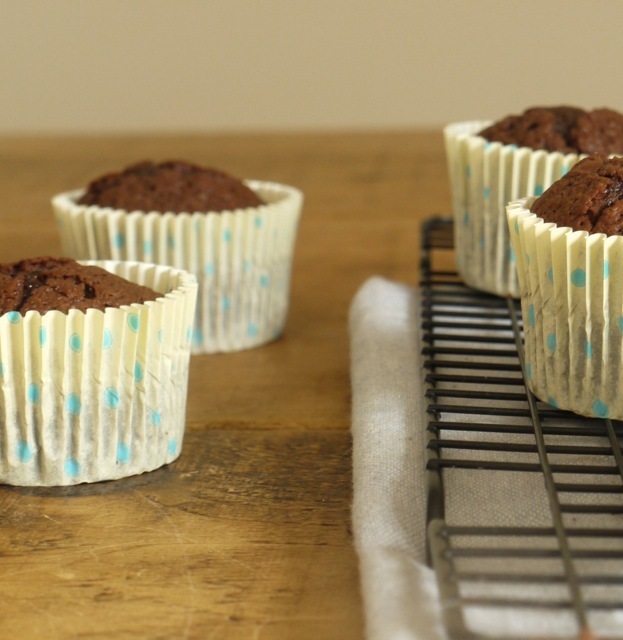 Transfer your buttercream to a piping bag fitted with a large round nozzle and pipe onto your cooled cupcakes. Decorate with the toasted flaked coconut. The frosted cupcakes will keep in an airtight container for 2 - 3 days. This recipe makes a generous amount of buttercream. If you don't use it all, the buttercream can be kept in an airtight container in the freezer for up to one month. Defrost fully in the fridge then beat again until light and creamy before using. If you're not planning to eat these cupcakes straight away, hold off adding the toasted coconut until the last minute as the flakes will soften into the buttercream over time. Happy 4 years of blogging! I think these cupcakes look terrific! Like you, I’m not usually into buttercream but this coconut version (with toasted coconut flakes!!) looks amazing. Wow! These look and sound amazing. I will be obsessing about them until I have time to make ’em. Pinning! These cupcakes look and sound amazing. I’ll be obsessing about them until I have time to make ’em! Pinned! These cupcakes sound absolutely delicious. 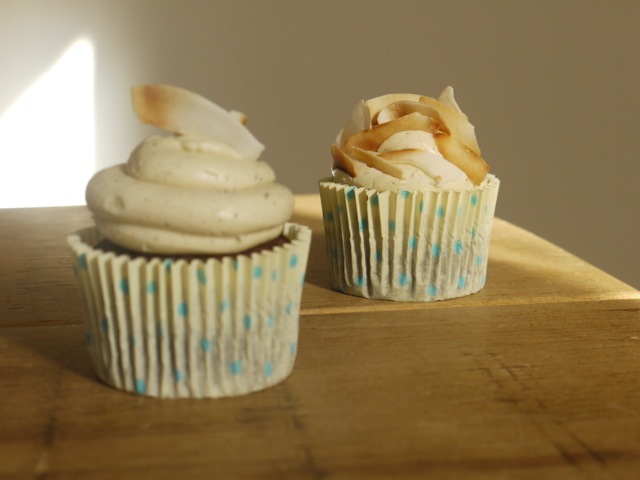 And the coconut buttercream is right up my alley! Happy 4 years – looking forward to reading your future posts! No bouncy castle?! At least there’s cake ;D Congrats on all you’ve achieved in 4 short years! Happy fourth blog birthday! These cupcakes are the sweetest way to celebrate indeed 🙂 I can’t wait to try that silky smooth swiss meringue buttercream! I can’t wait to see what you bake up for your book release! I think my fourth birthday party involved a Wizard of Oz cake that my talented (and tortured by her children) mother created including a yellow brick road and a cellophane Emerald City. Congrats on 4 year bloganniversary!! Yohoo and these cupcakes sound too perfect to me! That frosting though, I can see myself eating it with a spoon! Congratulations on your anniversary! 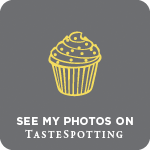 I’m a relatively new blogger and its inspiring to find people like yourself who are continuing to write, photograph, make or bake year after year. 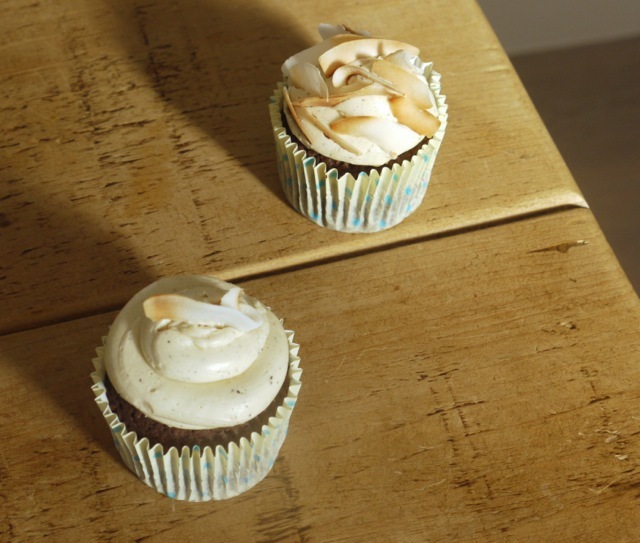 These cupcakes look delicious and I have to think that the meringue you made is just scrumptious. My niece’s first birthday is coming up soon…these may make a guest appearance as a treat for the adults! Congrats again.